And thus, following the success of his popular Brooklyn appetizing shop Shelsky’s of Brooklyn, Shelsky’s Brooklyn Bagels was born. A quick glance at the menu, you wouldn’t notice anything too out of the ordinary. The new Jewish bakery, which opened its doors in December, is stocked with every schemer imaginable, and all the classic bagel flavors: everything, egg, onion, and even gluten-free. But upon closer inspection, you might spot something a little non-traditional, which has recently caught the eye of the New York Times — pork roll with egg and cheese on a bialy. Pete Wells extols a breakfast treat on a bialy at Shelsky’s Brooklyn Bagels. A Jewish Bakery Adopts the Pork Roll, Egg and Cheese … https://www.nytimes.com/2019/02/12/dining/pork-roll-egg-and-cheese-bialy-shelskys-brooklyn.html?rref=collection%2Fbyline%2Fpete-wells&action=click&contentCollection=undefined&region=stream&module=stream_unit&version=latest&contentPlacement=1&pgtype=collection&fbclid=IwAR3lnIa0t2aiRhacVVJUIgks7g4235vcVR3QIvyGtmdYmXPVc-TluX33Zaw with Shelsky’s of Brooklyn: Appetizing & Delicatessen at Shelsky’s Brooklyn Bagels. Traditionally served on a kaiser roll, pork roll, also known as Taylor ham, is “a cured, smoked and cooked meat product that has the tightly pebbled appearance of engineered stone.” Originally, Shelsky planned to serve the breakfast delicacy, most popular in New Jersey, on a palm-sized bagel or the usual kaiser roll. But after receiving multiple requests from customers to substitute the carb for a bialy, Shelsky permanently added it to the menu. 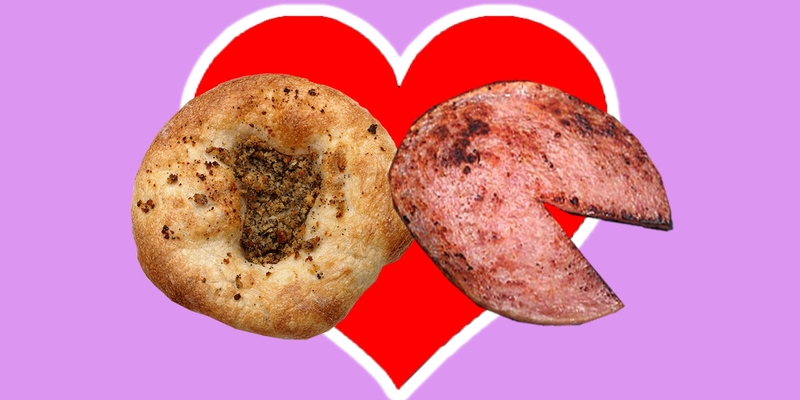 When Eastern European Jews brought the bialy to New York City from Bialystock, Poland, they probably never imagined the fate of their chewy delicacy being paired with non-kosher meat. Baked, not boiled, the bialy is usually eaten fresh from the oven with butter that mixes with the center’s pool of garlic and onion bits. But, as it turns out, Shelsky’s Brooklyn Bagels’ customers enjoy their bialys with egg, cheese, and pork roll just as much as they do solo. Will the pork roll bialy sandwich become a trend in 2019? Only time will tell.